Another week is in the books, and another string of injuries have hit fantasy football teams. Jordan Howard, Greg Olsen, Rob Kelley, Jordan Reed, and Corey Davis are just some of the big names that went down this week. This week’s waiver wire might not be as exciting as Week 2, but there still are players out there that can make a difference right away. Here are some guys to look to fill those holes for Week 3 waiver wire gems, with their respective ownership in Yahoo. Eddie Lacy was a healthy scratch. Thomas Rawls ran for 4 yards on 5 carries. Chris Carson, however, ran 20 times for 93 yards and caught 1 pass for 7 yards in Seattle’s Week 2 win over the 49rs. Chris Carson runs behind the same terrible offensive line than both Lacy and Rawls do, but has looked miles better than either. Carson has made something out of nothing, and seems to have the explosiveness that can make him a waiver wire gem this season. CJ Prosise will still see the passing downs, but Carson looks to be the clear starter in Seattle and should be added in all leagues. Buck Allen was mentioned in last week’s article, but Allen is only owned by half of fantasy leagues. Terrance West only touched the ball 10 times, and it looks as though Allen has outplayed him so far this season. Allen rushed 14 times for 66 yards and added 5 catches for 35 yards and a touchdown. We know QB Joe Flacco loves to throw to his running backs, which was evident in Allen’s 2nd place finish in targets on the team. At this point, Allen should be added in all formats in 10 team leagues. He could quickly take over this backfield entirely if West continues to struggle. Samaje Perine has had an up and down fantasy value in his rookie campaign. He was even being drafted before incumbent RB Rob Kelley in some leagues. Apparently the coaches “don’t forget a fumble”, and we haven’t seen much of Perine since the 1st preseason game. After not touching the ball in Week 1, most fantasy owners dropped Perine figuring he was a lost cause. A rib tissue injury for Kelley, however, means Perine will have the chance to shine again. Perine rushed 21 times for 67 yards and caught 1 pass for no gain. He will be the starter, with another player mentioned below (Chris Thompson) getting the passing downs as usual. As I’ve said before, opportunity trumps talent, so Perine should be added in all leagues. He may lose his spot once Kelley returns, but if Perine does actually shine the next few weeks, he could earn more playing time. Perine is a good answer for owners who are desperate for RBs. Andre Ellington may have out-snapped both Kerwynn Williams and Chris Johnson, but Chris Johnson stole the show in the 2nd half of the Cardinals 16-13 win over the Colts. Johnson only rushed 11 times for 44 yards, but looked to be the best runner in the group. By halftime, Johnson had taken over the starting role, making us remember why he was the starter in Arizona in years prior before injury brought David Johnson into the spotlight. Chris Johnson should be added in 14 team leagues, and it wouldn’t hurt to grab him in 10-12 team leagues as well. If Kerwynn continues to struggle, we may see more Chris Johnson on 1st and 2nd down, with Ellington playing passing downs. This backfield is still a nightmare, but it may be clearing up just a bit. JJ Nelson has had a good start to his season, catching a total of 10 passes for 163 yards and 2 touchdowns on 13 targets. With John Brown consistently hurt, and David Johnson being out for a majority of the year, Carson Palmer has looked to JJ Nelson to pick up the slack. The Cardinals also have one of the easiest schedules, playing Dallas (who was destroyed by Denver in Week 2) next week and San Francisco in Week 4. Nelson should be added in 12 team leagues, and could be the leading target in Arizona. 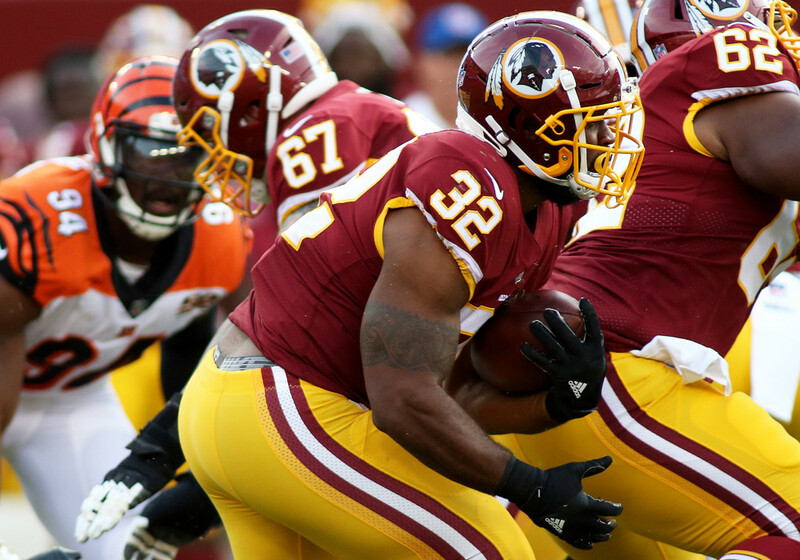 Chris Thompson has been the passing downs back in Washington for the last few years, but could see an uptick in carries with the injury to Rob Kelley. Thompson rushed 3 times for 77 yards and 2 touchdowns and caught 3 out of 7 targets for 29 yards in Washington’s Week 2 win over the Rams. Thompson looked explosive at times, and could have had an even bigger fantasy game had he caught a wide open pass in the third quarter (that probably would have been a touchdown). With Kelley out, Thompson should see a few more carries and still be targeted a lot. If Perine fumbles again and is benched for his career (since Gruden doesn’t forget fumbles), Thompson could become the lead back until Kelley returns. It’s a small chance, but either way Thompson is worth adding in 12-14 team leagues. Allen Hurns was mentioned in last week’s waiver wire article, but not many people trusted in the Jaguars’ receiver. This week, Hurns caught 6 of 7 targets for 82 yards and 1 touchdown. All of this production came later in the 2nd half, but most fantasy football fans know how good Blake Bortles can be in garbage time. With the Jaguars continuing to make the running game the focal point, we will see more games where they will eventually have to play from behind and throw more often. He may be a risky start in some weeks, but Hurns should be added in 12 team leagues, more so in PPR. Rashard Higgins was actually called up from the practice squad recently, and what perfect timing. Corey Coleman is lost for the foreseeable future with a broken hand, and Kenny Britt has been non-existent. Higgins was targeted 11 times in Week 2 and caught 7 passes for 95 yards. With the Browns playing from behind often, Higgins should see plenty of targets in a depleted Cleveland receiving core. He should be picked up in 12 team PPR leagues, and can be added in deeper standard leagues. Fantasy owners have probably all but forgotten about Will Fuller, who has been out recovering from a broken collar bone. Fuller had an okay 2016 rookie campaign, where he caught 47 of 92 targets for 635 yards and 2 touchdowns. Now that catch percent might look low, but remember the Texans had Brock Osweiler, who couldn’t hit water if he fell out of a boat. It is unsure how Fuller will be used with Watson/Savage, but if you are in a 14 team league and have a bench spot, add him now before he has a decent game and people remember who he is.